In the bathroom of my Great Grandmother’s House sat a traditional shaving kit. There was a mug with an old bar of shaving soap in the bottom, a badger hair brush, and a Safety Razor. My first attempt at shaving took place in that bathroom. The Safety Razor made quick work of my peach-fuzz mustache and I proudly admired my freshly shaven upper lip. Years later, when it was actually time to start shaving, I headed out to the local Rite Aid spent about $15 on a chrome Gillette. It wasn’t long before the cost of the razor was eclipsed by the cost of replacement blades. A lot has changed since I bought my first Gillette. These days razors come packed with three to five blades, some vibrate, and others come with a single blade for close detail work. Despite the changes in form and function, there is one thing that hasn’t changed. The fancy razor is the cheap part of the package. Replacement razor blades are what really hurts your wallet. Ever since my first visit to Calvaresi’s Barber Shop, I’ve been inspired to ditch the fancy razors and go back to basics. A Straight Razor, like my barber used, had the most appeal but I don’t know if I’m ready for one of those just yet. What makes the most sense is a Safety Razor, just like the one I used as a kid. Sure, I’ll still have to buy blades but they are far less expensive than replacement heads. A quick search on Amazon turns up a variety of razors to choose from. The one I’m about sold on is the Merkur Double-Edge Safety Razor. Setting myself up with the Merkur Safety Razor, a badger hair brush, blades, and soap isn’t exactly cheap but I’m guessing my money will go a whole lot further than if I were to continue with modern razors and shaving gels. Guide me in the ways of selecting and using a Safety Razor. That is a good razor, I use an Edwin Jagger. As far as blades, Feather are real nice and so are Derby. A box of 100 is around $10 and each blade lasts about 2 shaves depending on your beard and how often you shave. To begin, you might spend a few bucks, but it quickly pays for itself. I bought a salsa bowl at Walmart for $1.50 and use that to make my lather, works great. Check out BadgerAndBlade.com, they have great forums for this wonderful new adventure. And you are set for a year or two. Take your time, these blades are very sharp. I tend to only shave a portion of my face and neck (I keep a beard most of the time) so I can stretch a blade pretty far before it gets dull and starts tugging. I think your right, even with a steep initial investment (compared to an off-the-shelf modern razor), it should pay for itself. 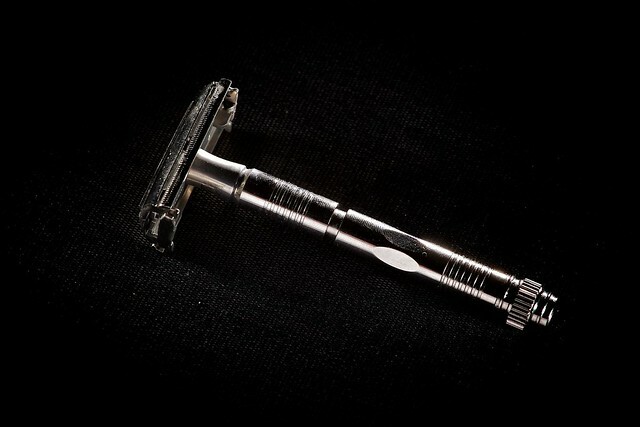 “Guide me in the ways of selecting and using a Safety Razor.” OK, first determine your budget. You can get a reasonably decent safety razor starting at about $15 but count on spending $30-50 for anything decent. Then you need to think about whether your want an “open comb” or a “safety bar” style: open comb razors are generally meant for those who have pretty heavy beards, while most safety bar razors will reduce the chance of nicks and cuts. Then there are 3 piece razors (mechanically simple, straight-forward design), 2 piece razors (still simple but a little more convenient), or 1 piece “twist to open” (TTO) like the old Gillette razors your grandfather used (not as mechanically simple but easier to load and unload blades). Merkur, Edwin Jagger, and Muhle are three well-established companies that make safety razors. Some other good brands include Maggard and Parker. BUT just as important as the razor is the blade! All double-edge safety razor blades are not made the same. They may look identical to the eye but can use very different grinding, bevels, and coatings. You should try a variety of blade brands to determine which one(s) work best for your combination of razor, skin, stubble, and even the type of shaving lather you use. I’ve been browsing sharpologist.com and it looks like there are plenty of articles to keep me busy. Thanks for all of the advice! I use a modern razor but I found when I switched to a badger brush and soap that the blades last twice as long. I actually get the razors from dollar shave club at this time – the nicest grade, every other month. So $54/year for blades. I’ve been seeing ads for Dollar Shave Club pop up on Facebook a lot lately. I haven’t looked into it but I’m glad to hear it is working out for you. If a Safety Razor isn’t for me, I might just have to take a closer look. Always move the razor in straight lines. If you let the razor slide sideways, you will also have to learn about styptic powder or styptic pencil. My father introduced me to a styptic pencil the first time I cut myself shaving. The sting isn’t a pleasant experience and I quickly learned to be careful. I’ll be extra careful with the new razor. The Art of Manliness has done several posts on this subject. You should check them out. I used to read Art of Manliness fairly regularly. My RSS Subscription must have gotten lost when transferring Feed Readers. I’ll have to re-subscribe. I know a fella that had some leftover quality badger/bowl/stand sets left when he closed a smokeshop. Happy to give a deal to a man who wants to look good for lady on Valentine’s Day. Your display was the first thing I thought of when I decided to look into a Safety Razor. Are you still at Cigars on the Avenue? I’m not looking to spend a small fortune to get setup but I wouldn’t mind taking a look at what you have left over. I find that new shavers have better luck with a chunkier handle or a longer handle that they can control and manipulate easier.